Norah Jones first seduced the world with her sultry voice on 2002’s Come Away with Me. Eight years and three albums later, Jones is still as captivating as ever. Case in point is her recently released fourth effort, The Fall, which was produced and engineered by Grammy Award-winner Jacquire King (Tom Waits, Kings of Leon). Taking a few days off in New York following a European tour, Jones chatted with me via telephone about the genesis of The Fall and why Santa Barbara is one of her favorite places to play. How long did it take you to record this album? About a month, but a lot of thinking and preproduction thought went into it. I did some demos for about a week about a year before we recorded, and from those demos I thought about what I really liked and what I wanted to change and what I kind of wanted to go for from that. The songs were all written. … Some of them were very different from each other, so I finally found the right producer to kind of help me figure out what I wanted and find it. Then it took about a month once we booked all the musicians. How did you come to work with Jacquire King? Mostly I just listened to a lot of records that I liked and things that I wanted to take from those records and kind of tried to find the right person that way. I ended up finding him on one of my favorite records of all time, Tom Waits’s Mule Variations. But it’s not like I really wanted this album to sound like that; I just thought, “Well, he’s a great engineer; he knows how to get the kind of sound I want.” That’s kind of how I started talking to him. How would you say he contributed to The Fall? Part of the thing is that the songs were kind of all over the place, but I wanted to tie them all in together. I think lyrically they worked together, so luckily that was a good thread, but musically they were kind of everywhere. Some of the songs could have fit on my last record, some of the songs were totally different and wouldn’t have fit on any of my other records. I think the goal was to bring them all into a different zone, and sonically I wanted things to sound a certain way. He’s a great engineer; he’s not just a producer, so that really helped. He was able to find exactly what you were looking for in the songs. Yeah. And I wanted to work with different musicians. I wanted to be out of my comfort zone, but I had to have somebody whom I felt comfortable with, so he was perfect. I wanted to be out of my comfort zone, but not out of control. [Laughs.] I didn’t want to be trying on hats and feel like I was being somebody I wasn’t. But that’s the danger when you’re trying something new. And there’s nothing wrong with trying. You don’t have to use it, but I knew what I wanted enough to know that we didn’t have to fish a lot for it. I just needed to find the right people. Are you looking forward to playing the Bowl? It’s one of my more favorite places to play. It’s a whole West Coast run. I don’t think we really needed to do the States again. We’re mostly doing it to play places like Santa Barbara Bowl and Red Rocks and the Greek in Berkeley and L.A. … They’re so fun. I couldn’t imagine touring without playing these places. There are a lot of good memories there. 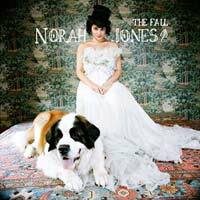 Norah Jones plays the Santa Barbara Bowl (1122 N. Milpas St.) on Tuesday, August 24, at 7 p.m. with opener Corinne Bailey Rae. Call 962-7411, or visit sbbowl.com for tickets.